Do you need an emergency tree assessment due to a Storm Damaged Tree or other weather related incident? Since we have seen plenty of storms in our time and the damage that can be done by trees in the Mt. Vernon and Lower Westchester County area; Mt. Vernon Tree Pruning and Removal Corp. can’t stress enough how important it is to get regular tree maintenance done to prevent problems for your home, building, storefront or business. And believe it or not, storm conditions aren’t the only reason that trees and branches can fall damaging property! 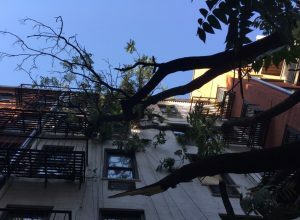 If regular trimming and pruning is not provided and certain trees are allowed to grow too tall without being shaped, accidents can most certainly happen. One of the most important things to remember is that you should never try to remove damaged limbs yourself. This is very dangerous! Certified arborists or tree service professionals should always be called in to take care of broken or hanging limbs. So call us right away if you have storm damaged trees or an emergency that needs attention... We're here to help! At Mount Vernon Tree Service of Lower Westchester, our tree company strives to give consistent attention to detail and customer satisfaction. When it comes to tree health, tree pruning, tree trimming, tree cutting, tree removal, stump grinding, storm clean-up, tree shaping, and planting, we have it covered! © MT Vernon Tree Prunning Removal Corp.. All rights reserved.